The Book of Lost Tales is a collection of early stories by English writer J. R. R. Tolkien, published as the first two volumes of Christopher Tolkien's 12-volume series The History of Middle-earth, in which he presents and analyzes the manuscripts of those stories, which were the earliest form of the complex fictional myths that would eventually comprise The Silmarillion. Each of the Tales is followed by notes and a detailed commentary by Christopher Tolkien. For publication the book was split into two volumes: The Book of Lost Tales 1 (1983) and The Book of Lost Tales 2 (1984), but this is simply an editorial division. 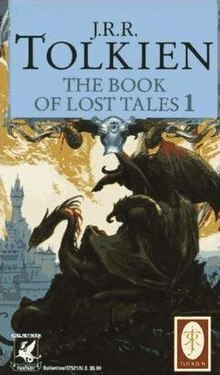 Both volumes are separated into several "Lost Tales". Though they cover a broadly similar history, the Tales are very different from The Silmarillion. Firstly the Tales are more complex and detailed than The Silmarillion: they are written in a less formal but more archaic style and include many obsolete words and phrases. Secondly the interaction between the different elf-races is profoundly different: the exiled Noldoli (the Noldor of the later histories) suffer decisive defeat much earlier and become slaves of the enemy they had sought to punish. Thus when Thingol feels disdain for Beren it is because the latter is a gnome (not a mortal human) and therefore a thrall of Melko (an earlier name for Melkor). While many of the names in the book are identical or close to those in the later versions, some of them bear almost no resemblance to their final forms. Tolkien changed names rather frequently, sometimes with several new variants (rejected in turn) written in a single manuscript. Confusingly, sometimes the name applied to one thing is later used to refer to something quite different, the original use abandoned. For example, the house of Elves called "Teleri" in The Book of Lost Tales is not the same as that of The Silmarillion (see Teleri). The original usage of "Teleri" would eventually change until the name became "Vanyar", while the house of Elves called "Solosimpi" would inherit the name "Teleri". In the frame story of the book, a mortal Man visits the Elvish Isle of Tol Eressëa where he learns the history of its inhabitants. In the earlier versions this man is named Eriol and is of some vague north European origin. In later versions he becomes Ælfwine, an Englishman of the Middle-ages. There are more changes visible within the book, and it is not internally consistent, partially because even while still writing it Tolkien began rewriting earlier parts as his ideas about the world changed. The Tales were eventually abandoned, but they were resurrected in part as the "Sketch of the Mythology" which would become the Silmarillion. "The Theft of Melko and the Darkening of Valinor"
"The Tale of the Sun and Moon"
"Gilfanon's Tale: The Travail of the Noldoli and the Coming of Mankind"
"The History of Eriol or Ælfwine and the End of the Tales"—an essay about the changes in the framework, and the "unwritten" tales. There is an inscription in the Fëanorian characters (Tengwar, an alphabet Tolkien has devised for High-Elves) in the first pages of every History of Middle-earth volume, written by Christopher Tolkien and describing the contents of the book. This is the first part of the Book of the Lost Tales of Elfinesse which Eriol the Mariner learned from the Elves of Tol Eressëa, the Lonely Isle in the western ocean, and afterwards wrote in the Golden Book of Tavrobel. Herein are told the Tales of Valinor, from the Music of the Ainur to the Exile of the Noldoli and the Hiding of Valinor. This is the second part of the Book of the Lost Tales of Elfinesse which Eriol the Mariner learned from the Elves of Tol Eressëa, the Lonely Isle in the western ocean, and afterwards wrote in the Golden Book of Tavrobel. Herein are told the Tales of Beren and Tinúviel, of the Fall of Gondolin and the Necklace of the Dwarves. This page was last edited on 7 March 2019, at 18:24 (UTC).